Rev. Derrick McDonald was born in Pontiac, Michigan, to Rev. Eddie A. McDonald (deceased) and Mary E. McDonald. Upon graduating from Pontiac Northern High School, he began working for General Motors Corporation and returned to school earning a B.S. from Northwood Institute, Midland Michigan. Rev. 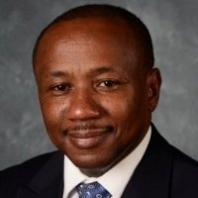 McDonald has held various positions with many companies and is currently Vice President of Human Resources for Comer Holdings. Rev. 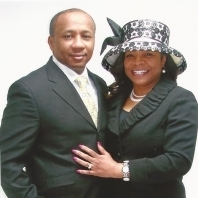 McDonald was for more than forty years active in various ministries of Friendship Missionary Baptist Church. He received his religious upbringing and guidance under the leadership of his father Pastor Eddie A. McDonald to whom he confessed his call to the ministry January 23, 1999 and was licensed to preach March 28,1999. Serving under the leadership of Dr. William H. Dulaney, Rev. McDonald was ordained as a Gospel Minister November 24, 2002. Rev. McDonald has been blessed to have the opportunity preach, teach and lecture at churches on District, State and Regional levels as well as the Crystal Lake District Congress Association, Wolverine State Congress, and Walter Cade Regional Workshop of the National Baptist Convention. He currently serves as Dean of the Crystal Lake Baptist District Association. Additionally, he has participated in and conducted various street evangelistic ministries. In April 2008 Rev. McDonald was called to pastor Prospect Missionary Baptist Church, Pontiac, Michigan where he is leading in the transformation of lives. Pastor McDonald is grateful to have seen the congregation increase, but is most thankful for the spiritual growth experienced at Prospect. Rev. McDonald believes that the church which Christ built shall continue its growth as Christian lives are built. Rev. McDonald believing, as his father taught, that the call to ministry is a call to preparation, has continued to pursue a higher religious education and has earned a Master of Ministry Degree, and is preparing to pursue his Doctorate. Rev. McDonald has throughout the years, and continues to be active in the community. He has a great love for youth and encourages them to always strive for their best. Rev. McDonald has a vision to evangelize the community at large, believing that the church must return to its respected place in the world, through sharing the good news of the gospel and reflecting the love of Jesus Christ. Rev. McDonald is married to Barbara (Herring) McDonald. They have two children Antonio and Jennifer.